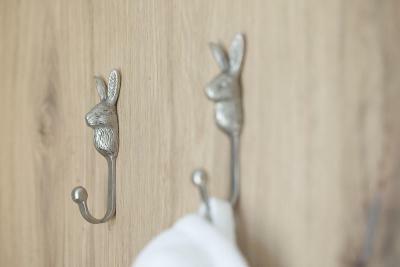 Lock in a great price for Hotel Steffani – rated 8.8 by recent guests! Great Hotel, staff were amazing, centrally located, free parking and rooms are big. specially if you are travelling with family, this is a hotel to be. Nice room, helpful staff. Great breakfast! Convenient location to everything in town. Nice pool and sauna area. Had dinner at the Chinese restaurant located in the building and loved it. 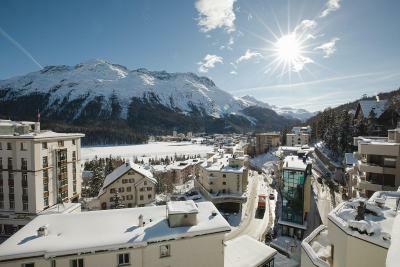 Rooms were pricey, but everything is in St. Moritz. Vey close to train for Corviglia if you plan on skiing. I can't overemphasize how amazing our stay was at Hotel Steffani. Everything exceeded our expectations, from the food and drinks, to the great location. The hospitality of the staff and the family who owns the hotel is nothing short of exceptional, truly amazing people! The breakfast selection is exce5 and the staff is eager to assist with every thing! The crew was amazing and met our every need. The train shuttle is a bonus. Very accommodating. No problem on shuttle from train station to hotel & vice-versa. Assigned us a perfect room. Provided us immediately the requested electric kettle. Very friendly staff. The location is in the city center. The staff is friendly. Breakfast was delicious. Excellent location. Rooms with lake view are a must! The room was spacious and had a great view of the mountains and the lake. The swimming pool was also really nice. Hotel Steffani This rating is a reflection of how the property compares to the industry standard when it comes to price, facilities and services available. It's based on a self-evaluation by the property. Use this rating to help choose your stay! 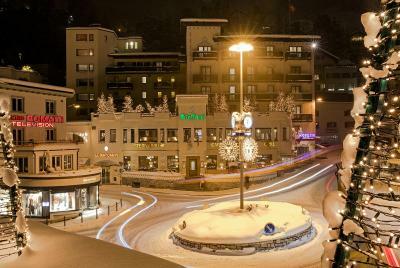 One of our best sellers in St. Moritz! 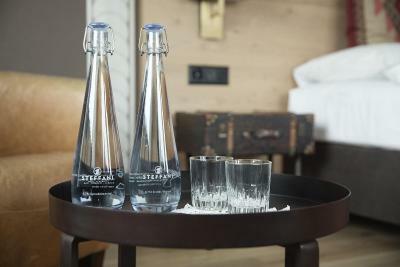 Located in the center of Sankt Moritz, 1,000 feet from the funicular to the Corviglia Ski Area, the traditional, family-run Hotel Steffani offers 3 restaurants, 3 bars, a night club, and a spa area with an indoor pool, sauna, steam bath, relaxation area, and massage room. 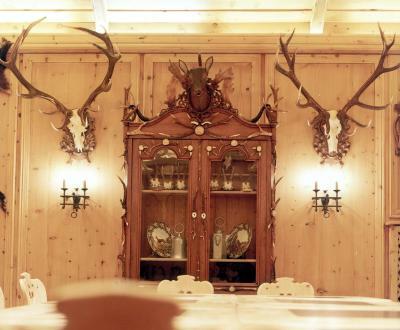 Guests can dine in the one-and-only Chinese restaurant in St. Moritz called Le Mandarin, enjoy grilled dishes and fish in the Stüva Grill, or characteristic Swiss and Italian cuisine in the Lapin Bleu restaurant, which is the oldest restaurant in St. Moritz. The Steffani Hotel also features 3 bars, the Dance Club Vivai, and a hair and beauty salon, and provides free WiFi in all areas. A private parking garage can be used at an additional cost. Discounted ski passes are available at the reception. 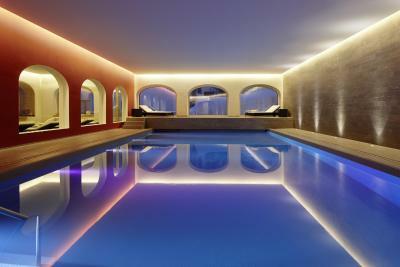 This property also has one of the top-rated locations in St. Moritz! Guests are happier about it compared to other properties in the area. 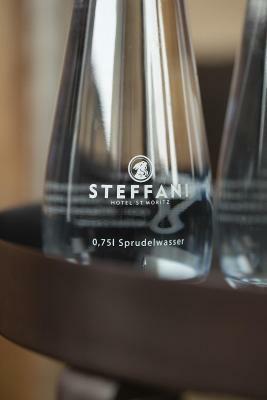 When would you like to stay at Hotel Steffani? 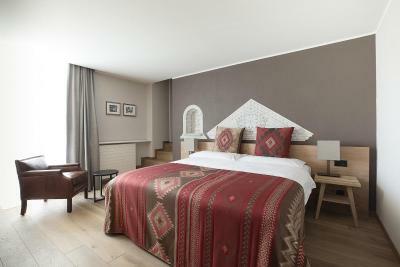 These rooms offer views of the Engadine mountains or the quiet garden. They come with a work desk, a seating area and a bathroom with a bath and a shower. 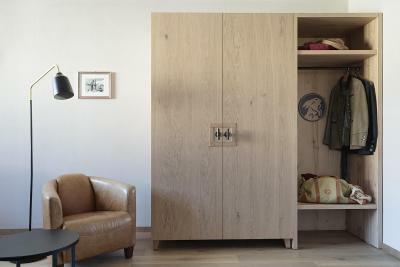 These rooms come with furniture made of local wood. 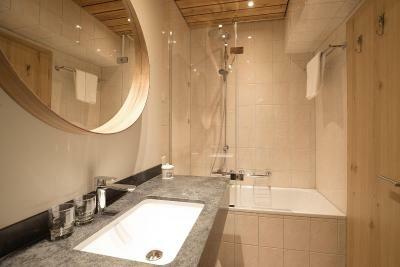 Most room have a balcony offering views of the Engadin mountains or the quiet garden. These room feature a seating area, a work desk and a single bed. Most room have a balcony with nice views. This room overlooks the garden and it comes with a seating area and a private bathroom. 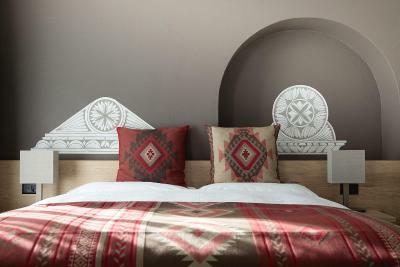 These rooms come with a double bed and a single bed, which can also be used as a sofa. 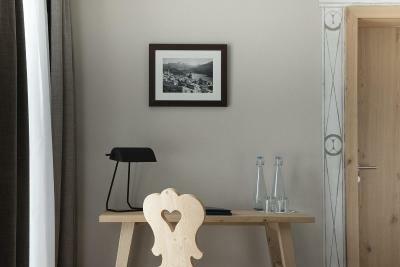 Most rooms have a balcony offering views of the Engadine mountains. Spacious, traditionally furnished room. Most of them have a balcony with nice views. 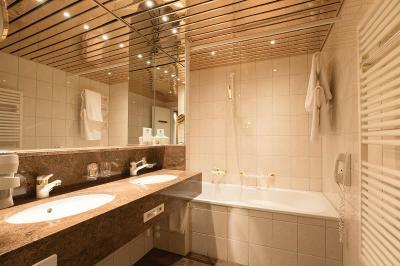 This traditionally-furnished room comes with a seating area and a marble bathroom with a shower and bathtub. 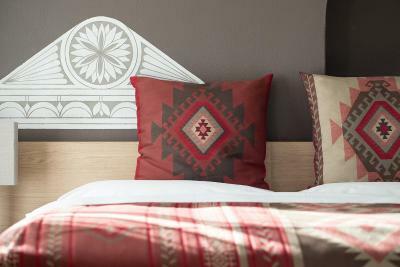 Most rooms feature a balcony, offering panoramic views of the surrounding mountains and the lake and some units are fitted with an open bathroom featuring views of the mountains. 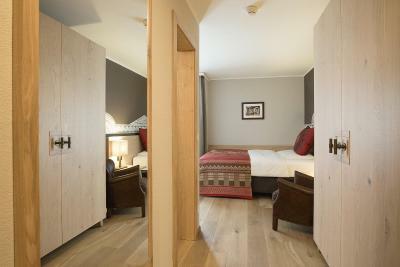 Spacious junior suite featuring Arven wood furniture, a separate bedroom, a balcony and a big bathroom with a spa bath. 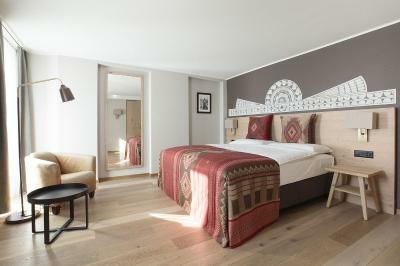 This suite features a large window offering panoramic views of the Engadin mountains. It also comes with a separate living room with a fireplace, a dining area, a kitchenette, a balcony and a private bathroom. 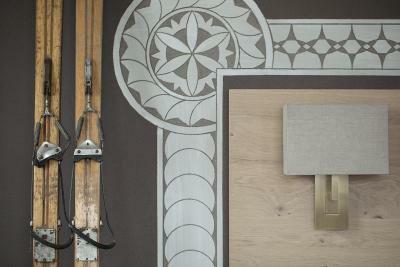 The walls are paneled with Arven wood. There is a connecting door to a small single room. 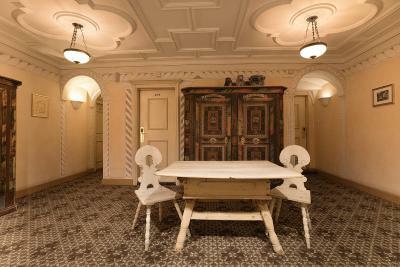 Please note that the suite is not accessible by wheelchair, as there are some steps. 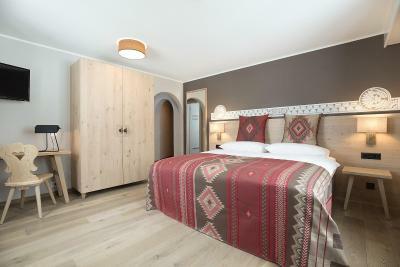 This suite is fitted with local Arven wood furnishings and features large panoramic windows offering views of the Engadin Mountains. There is a separate living area with a working fireplace, a winter garden and kitchenette. 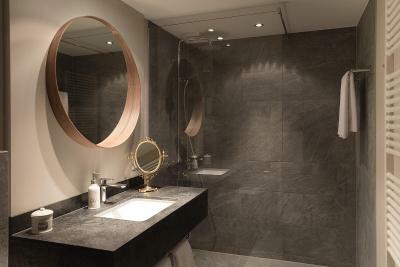 The bathroom features a large bath with a view over the city. 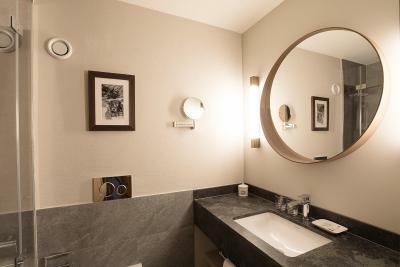 The family owned and run Hotel Steffani is located in the center of St.Moritz, only 3 min walking distance to the Chantarella funicular to the Ski area Corviglia. Discounted ski passes are available at The Front Desk for guests. 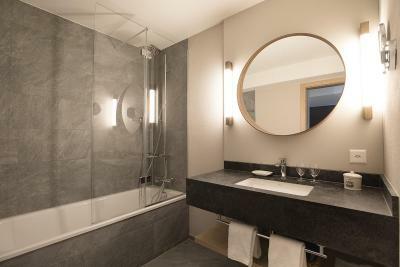 To relax & unwind the hotel features a modern Pool & Spa oasis including an indoor swimming pool, steam room, sauna, relaxation area and a massage room. 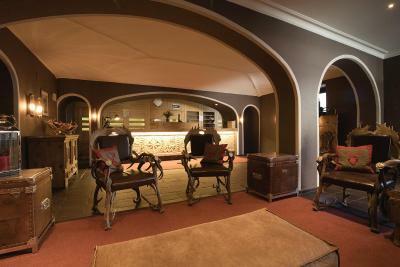 Also guests will find a Hair & Beauty Salon at the hotel. The Hotel features 3 fine restaurants, Le Lapin Bleu, which is the first and oldest restaurant in the village, serving Italian and Swiss specialties, Le Mandarin which invites you to experience the flavours of China, and the Stüva Grill serving grill delicacies. 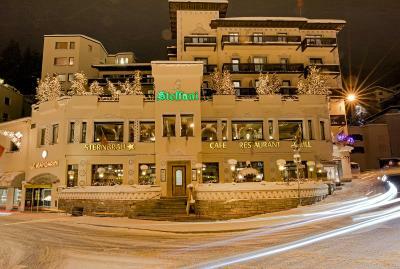 At The Steffani you will also find 3 bars, where local and tourists meet for an aperitif or nightcap and a Dance Club. 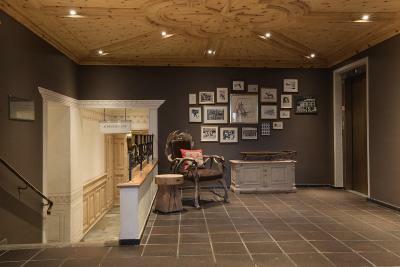 Rooms are decorated in the Engadin Style and feature local materials like pine woods. 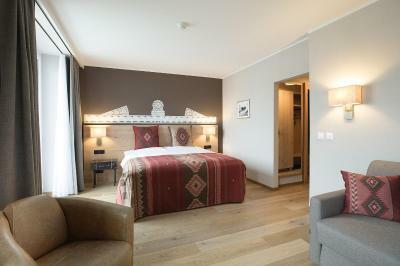 Some rooms have balconies with beautiful views over the Engadin mountains. 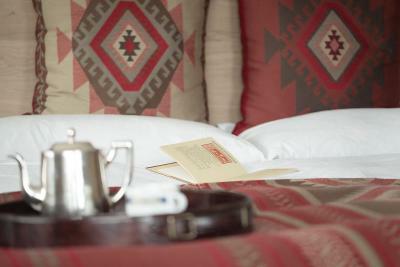 From basic rooms up to luxurious suites, The Steffani offers something for everyone’s taste. 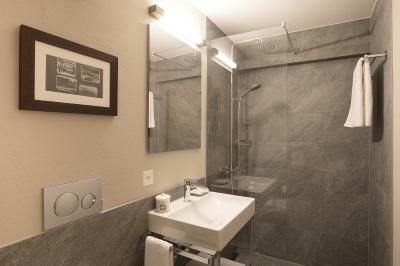 Some rooms have recently been refurbished. Free Wifi is available. Hotel has it's own parking garage. 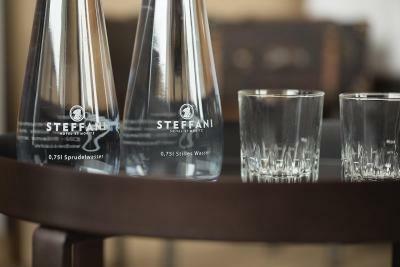 House Rules Hotel Steffani takes special requests – add in the next step! 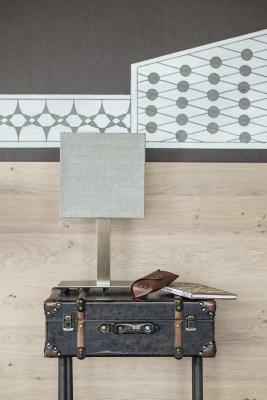 Hotel Steffani accepts these cards and reserves the right to temporarily hold an amount prior to arrival. If you arrive by car, please inform the property in advance. Heated garage parking is available at a surcharge in addition to the free outdoor parking. Hospitality was fantastic! Restaurant and breakfast were good as well. despite having an excellent breakfast my wife and I had a gastro intestinal problem and spent the next two days very sick , we had only eaten there!! Very good value at the end of the skiing season! We were in an unrenovated room (with a great balcony and view) - but there were no plug sockets near a mirror for hair drying. However the hotel did provide us with an extension lead when asked. The Lapin Bleu restaurant and the onsite Chinese restaurant were really good. Nice choice of breads at breakfast. Nice choice of bars. The hotel staff were great. Room had complimentary water every day. 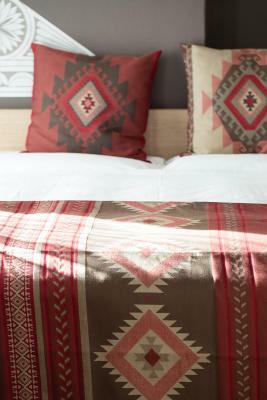 Cleaning our room in the morning and the bed making in the evening make us comfortable to stay there. Employees were really helpful and attentive. Breakfast was simple. For room price could have been a bit more impressive. 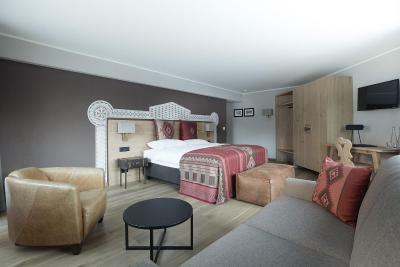 The room was newly renovated. Nice, small spa. front desk very helpful.